Much has been written about Sylvester Stallone writing the first version of the Rocky script in just a few days, but little is mentioned about Rocky actually being his 8th script. (The other seven were never produced.) 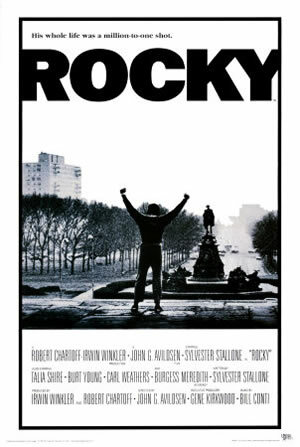 Stallone has also said that only about 10 % of that first Rocky script remained in the finished version of the film that would go on to win the Best Picture Oscar. Since Stallone started with “redemption, redemption. redemption” in mind I’ll put him down as starting from theme. * Chuck Wepner was working as a liquor salesman in New Jersey back in 1975 when fought Heavyweight Champion Muhammad Ali. With some odds 30-1 against Wepner, he lasted until the fifteenth round before Ali won the fight on a technical knocked out . In 2003, Wepner sued Stallone for his name and story being used without his permission in the marketing of the Rocky franchise. (Lawsuit.) In 2006 there were reports that the case was settled out of court.